Ideal for those with mature skin. Apply a dime-sized amount twice daily following cleansing for firm, smooth, radiant skin. Follow with the appropriate PCA Skin broad-spectrum SPF product in the daytime. Palmitoyl Tripeptide-38 is a peptide that stimulates collagen and helps reduce the appearance of fine lines and wrinkles. Epidermal Growth Factor (EGF) improves the appearance of aging skin. Glycosaminoglycans are important hydrating components. Cocos Nucifera (Coconut) Fruit Juice is a lipid, mineral and fatty acid-rich emollient agent. Silybum Marianum Extract is a potent antioxidant from milk thistle. Tocopherol and Tocotrienols are fat-soluble antioxidant vitamins and emollient ingredients. Sodium Hyaluronate is a naturally occurring glycosaminoglycan with exceptional lubricating qualities. It has the ability to hold 1,000 times its weight in water and plays an important role in skin hydration. Palmitoyl Tripeptide-38, Epidermal Growth Factor (EGF), Glycosaminoglycans, Cocos Nucifera (Coconut) Fruit Juice, Silybum Marianum Extract, Tocopherol and Tocotrienols, Sodium Hyaluronate. My skin is usually dry with fine lines and thus product truly has changed the surface texture .....simoother and more moisturized!!!! 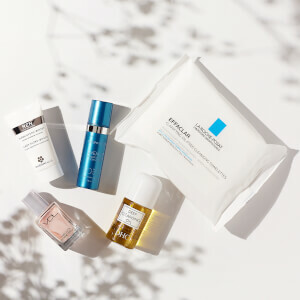 I only use PCA Skin on my face; nothing else! I go for mini dermabrasions every six weeks using only PCA Skin products. 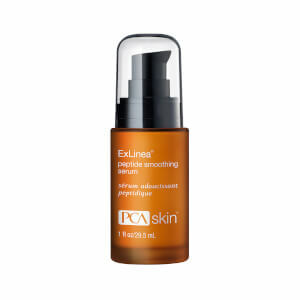 I have used Total Strength Serum paired with PCA Skin Ex Linea on my face every morning after washing my face. I love what it does to my skin....smoother, brighter, while tiny wrinkles around my eye seem to disappear! Have been using this combination for about four years and won't change! I've been using this twice a day for the last 1.5 years. When I look at pictures from before and after, my skin as become more youthful and healthy looking. I have used this before and it seems to work nicely. Seems to make the skin look smoother. Excellent product..been using it for over a month and see the difference on how my skin looks and feels! Started using it about 10 days ago; I layer it with Ex Linea -- my skin looks smoother, brighter. Was using SkinMedica TNS recovery complex, but I think I prefer this combination, even after such a short time I can see a difference! I recently purchased this product and am using it with Ex Linea serum. I am hoping to see fine lines and wrinkles along with my pores diminishing. It was recommended to me by my esthetician. I have been using this with the PCA peptide serum for several months and am really pleased with the results. My skin looks a little plumper, a little more even-toned, and just refreshed. I'm close to 40 and think this will get me through the years gracefully! Love this paired with ExLinea! Gives my skin a more youthful appearance. Over 40 & this serum paired with the PCA peptide serum really makes a difference in the appearance and smoothness of my dry and semi-arid desert affected skin!